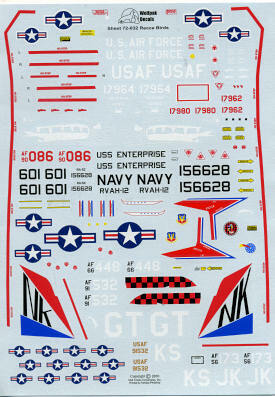 This latest sheet from Wolfpak decals provides us with eight different markings options for various reconnaissance aircraft, most of them from around the Vietnam war ers. First up is a red nosed RA-5C from RVAH-12 aboard the USS Enterprise during the last years of the operation of the Vigilante. Next a U-2R from the 9th RW. This relatively current aircraft has a large dragon's mouth chalked on the nose. Next is an SR-71 and this time, w have three markings options (well, basically serial number options as SR-71s were not the most colorful planes in the skies. We have one from 1981, one from 1983 and one used during Libyan ops in 1986. 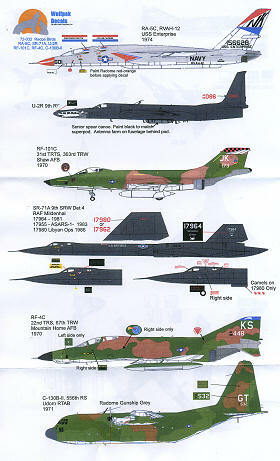 Of course, a recce sheet would not be complete without an RF-4C and the one on this sheet is from the 22 TRS/67 TRW then based at Mountain Home AFB in 1970. Finally a big one; a C-130B-II from the 556 RS at Udorn, Thailand during 1971. Some of these aircraft will require some modification from the kits available, and the instructions provide the information that is needed to make these upgrades (or backdates in some cases). Thanks to WolfPak Decals for the review sample. You can order yours direct via Paypal using sales@millcreekconsultants.com for the reference. Free US shipping, Canada and Mexico add $3 and rest of the world add $4.